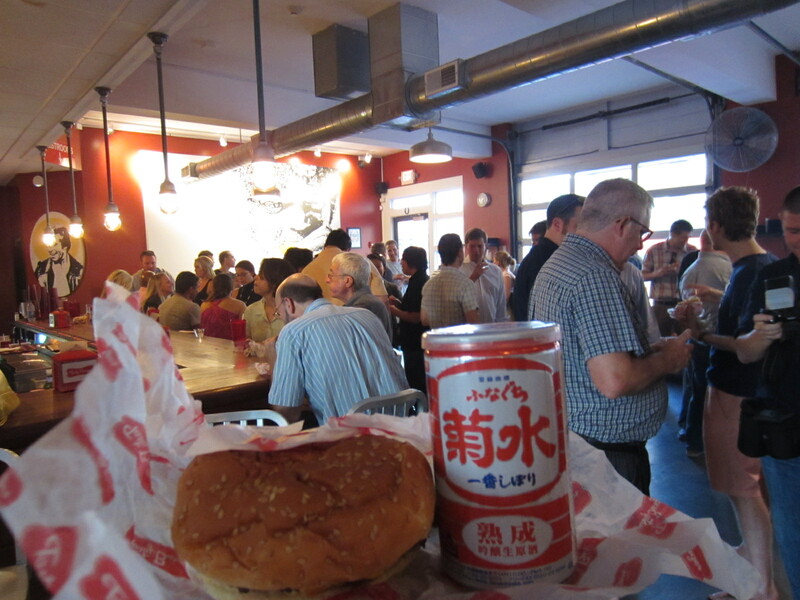 Home » events » sake + burger night. recap. sake + burger night. recap. Sake and burgers. It seemed like a obvious pairing to me, but to others, it was unheard of. 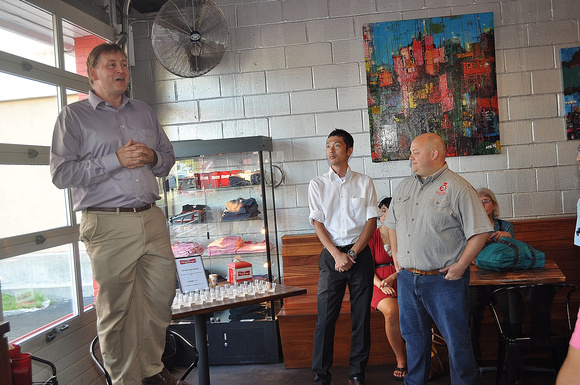 The idea behind Monday’s event was to show Sake in a new light and to give people a new experience with Sake. We certainly achieved that! 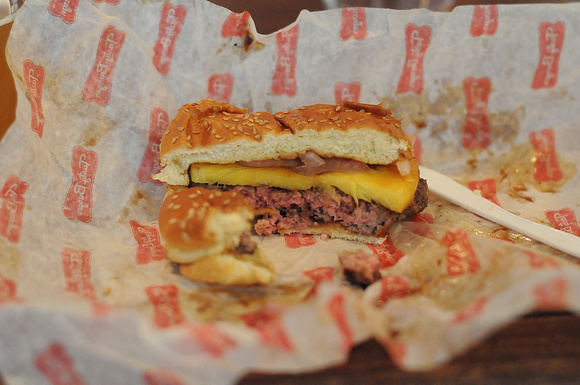 Before this post goes further, I must thank the 105 people who came to Tasty Burger for this pioneering event. Your attendance and sense of adventure really made for a fun night. In Japan, Sake is not a natural pairing with sushi. Sushi and Sake both rely on similar flavors and balance in their construction – rice, sweetness (sugar), and acidity – and are so closely related that many of the sushi-Sake pairings are not often complimentary or new. In Japan I often found myself enjoying Sake in very casual izakaya, while eating grilled meats, deep fried foods, tofu and vegetable dishes; really almost anything but sushi. 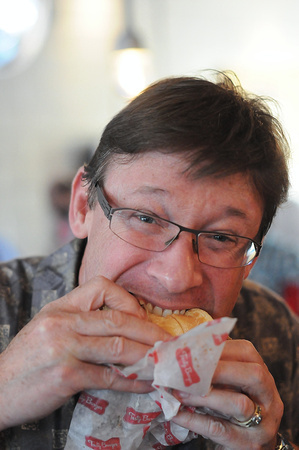 This was my inspiration for our event at Tasty Burger. In a Japanese izakaya you will often find an array of foods cooked many different ways and a clientele equally diverse. Since there are very few real izakaya in Boston I focused on the atmosphere of the place first. Tasty Burger has many of the qualities that a good izakaya has: laid back atmosphere, large drink selection, good comfort food that doesn’t take itself too seriously, and an adherence to quality. The customer base at Tasty also reflects izakaya values: you can sit down and have a tasty burger and a great beer with anyone from 21 to 81. Monday night started off smoothly with a few words from Bhaird Campbell from the Japan Society of Boston, Takeshi Endo from Kikusui Brewing and your’s truly. All three of us knew from the crowd that speaking should be kept to a minimum since over 100 people showed up for some serious Sake and burgers. Once my short talk had ended, I noticed the first platter of burgers coming from the kitchen – we were off and running! This burger is straight from Tasty’s fabulous menu: their house burger patty topped with grilled red onion, a pineapple slice and teriyaki sauce. 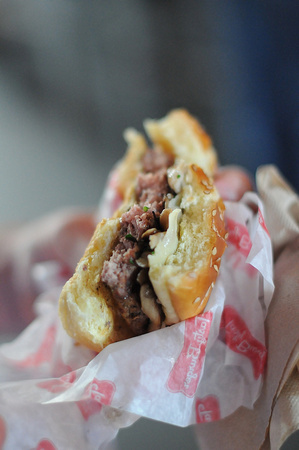 It masters the balance of salty and sweet with the caramelized teriyaki in a supporting role. The shake (made just for the event!) was a beautiful blend of milk, pineapple and Nigori Sake. Kikusui’s Perfect Snow Nigori is an undiluted Sake at 21% ABV, so the Sake did not get lost in the shake. These were dangerously delicious. 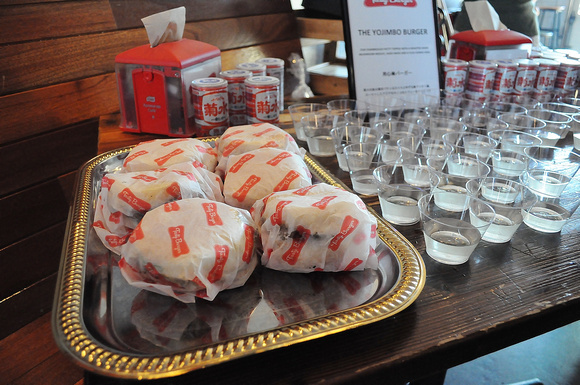 This burger was one of two created just for this event: a burger topped with a roasted Japanese mushroom mix, aged swiss cheese, and a yuzukosho aioli. As Kikusui’s Funaguchi Sake ages, it becomes earthier and richer with flavors of Koji, sherry and rice-like nuttiness. These attributes were a perfect match for this earthy burger, with the yuzukosho giving a contrasting finish of citrus and heat. Our second custom creation: this burger is grilled with a miso-negi glaze and topped with a daikon scallion relish. When we tasted the Sake in preparation for the event, David at Tasty Burger noted the big fruit and fresh “green” notes of the Sake and knew he wanted scallions on this burger. Using scallions 2 ways, this burger was a nice pairing with those tropical and green fruit notes, rice sweetness, and big body of Kikusui’s original canned Sake. In the end, this original event was not only very fun but ended up being one of the biggest Sake events that Boston has ever seen. The perfect melding of a lively atmosphere, great casual food and Sake pairings, wonderful guests, and an amazing staff at Tasty made this event one that begs to be repeated. I hope that everyone came away with a sense of Sake as a fun and relaxing beverage that definitely has a place outside of Japanese restaurants. 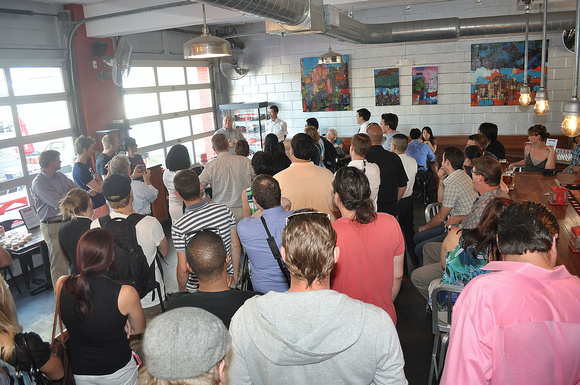 Stay tuned for my next event at another casual and fun eatery…now just to figure out where that will be!